What would you do if you knew that divine judgment on your country and the world was imminent? If you are Jonathan Cahn, you write two best-selling books that detail the revelations that you have received about how the United States is already undergoing judgment and has been for more than a decade. Like a latter day prophet of the Bible, Cahn is issuing his warning that September 13, 2015 might be the next key date in the ongoing series of judgments using a variety of mediums, from television to the internet, that were not available to the prophets of old. Cahn’s first book, “The Harbinger,” dealt with clues that linked the September 11 attacks and the 2008 financial crisis to the prophetic judgments found in the Book of Isaiah as well as to an ancient Jewish custom of forgiving all debts and letting fields lie fallow every seventh year. It is the story of this Sabbath year that Cahn expounds upon in his newest book, “The Mystery of the Shemitah,” the Jewish term for the Sabbath year.Cahn’s analysis of the relationship between the terrorist attacks of September 11 and the 2008 economic collapse turned up the astounding fact that stock market collapses in both years, which currently rank as the two largest stock market point crashes in U.S. history, occurred on the same day of the Jewish calendar. Even more remarkable is the fact that the Jewish date on which the markets collapsed was the last day of the Shemitah year, the day in which all debts were wiped away. This action would result in a situation much like a modern recession as the accumulated wealth of seven years was blotted out and agricultural production plummeted. When Cahn looked back at previous Shemitah years, he found that the pattern extended even farther back into U.S. history. The Shemitah of September 1993 through September 1994 (the Jewish New Year starts in September on the Gregorian calendar used by the U.S.) saw a selloff in the bond market that swept around the world. In 1987, a stock market crash occurred that held the record for largest point drop in a single day until the post-9/11 crash of 2001. In 1980, the U.S. suffered a severe recession that lasted until 1982. In 1973, an oil shock brought on by the Arab oil embargo sparked another recession. In 1966, the U.S. experienced a credit crisis. In 1958, the Eisenhower Recession was a sharp, worldwide downturn. For more than 50 years, every Shemitah year has seen the U.S. experience financial upheaval. 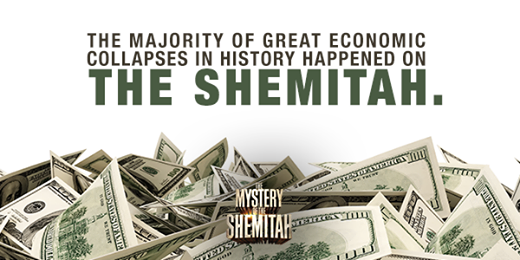 In addition, the Shemitah was linked to the Great Depression as well. Although the initial stock market crash of 1929 was not in a Shemitah year, the decade of the 1930s contained two Shemitahs, 1930-31 and 1937-38. As a chart of the Dow Jones Industrial Average of the 1930s shows, 1932 was the darkest year of the Great Depression. By 1937, the recovery had begun, but country experienced a second recession within the Depression. As Cahn points out, the law of averages would dictate that there is only a one-in-seven chance, less than a 15 percent, of a recession or crash occurring within a Shemitah. When the statistics are examined, the relationship between financial upheaval and the Shemitah is far stronger than can be explained by random chance. The Wall St. Journal’s list of the 20 largest one day stock market crashes includes 10 that are in a Shemitah year. Nine of these crashes were in Elul, the last month of the Shemitah, or Tishri, the first month of the year that follows the Shemitah (late September or October on our calendar). A further three crashes were in months that followed (November and December). The total of 13 crashes, more than half of the crashes, is far more than the 15 percent expected. The same list also shows that many of the largest stock market gains come in the wake of the Shemitah. If the Shemitah culminates in a recession, the recovery would be expected to begin in the first months of the new Jewish year. In all, five of the largest 20 gains occurred during a Shemitah year, which is close to the random distribution. Seven of the largest gains occurred in the wake of the Shemitah. This may reflect the extreme volatility of the markets in the Shemitah. Many economists note that sudden, sharp crashes are often followed by equally quick recoveries. Many stock market analysts have noted the tendency of the stock market to falter in the fall of the year. This correlation may be explained by the end of Shemitah, which occurs in September, and the recovery that follows. Additionally, the National Bureau of Economic Analysis lists 33 business cycles that have impacted the U.S. economy. A comparison of the list of business cycles to Shemitah years shows that in four cases the cycle was entirely contained within a Shemitah. In 14 cases, the cycle was partly contained within the Shemitah including three cycles which completed before the culmination of the Shemitah. The 18 cycles which were linked to the Shemitah is more than half of the U.S. business cycles. Cahn goes further. In “The Harbinger” Cahn discussed the link between the towers of the World Trade Center and an obscure Bible verse quoted by Sen. Tom Daschle (D-S.D.) on the Senate floor on September 12, 2001. The same verse, defiantly vowing to rebuild the towers, symbols of pride, was echoed repeatedly in the following years by other government officials. Cahn relates that the World Trade Center was conceived in the Shemitah year of 1945 when it was proposed by developer David Scholz. Groundbreaking for the World Trade Center was in the Shemitah year of 1966. In the Shemitah year of 1973, the twin towers opened as the world’s tallest buildings. In the Shemitah year of 1993, terrorists exploded a car bomb in the basement garage of the north tower, killing six people and injuring more than a thousand. Seven years later, in the Shemitah year of 2001, another group of terrorists succeeded in destroying the World Trade Center. The new tower on the World Trade Center site, One World Trade Center, also called the Freedom Tower, opened six weeks into the current Shemitah on Nov. 3, 2014. Cahn also discusses the seventh Shemitah, the Jubilee. The 50th year, the year following the seventh Shemitah, was a “super Shemitah” that restored lands to their previous owners and set captives free. According to Cahn, no one today is sure when the Jubilee occurs, but there is another startling pattern. On November 2, 1917, British Foreign Secretary James Balfour signed the Balfour Declaration, which began the process of restoring a Jewish homeland in Palestine. This followed the 1916-17 Shemitah. Fast forward 50 years to June 7, 1967. This was the day that Israeli forces recaptured the city of Jerusalem in the Six Day War. This momentous event followed the Shemitah of 1965-66. This pattern suggests the possibility that these restorations both took place in Jubilee years. If Cahn’s assumption is correct, the next Jubilee would follow the current Shemitah. The current Shemitah runs from September 25, 2014 through September 13, 2015 and the possible Jubilee would begin on September 14, 2015 through October 2, 2016. Cahn points out the confluence of astronomical signs in the current Shemitah as well. The current Shemitah is associated with four blood moons, partial lunar eclipses, all of which fall on Jewish holidays. Additionally, there will be two solar eclipses. The first occurs exactly halfway through the Shemitah and the other on September 13, the last day of the Shemitah. Eclipses are often associated with judgment in the Bible. Cahn makes no predictions about what to expect during the Shemitah and the possible Jubilee. As financial forecasts note, past performance is not indicative of future results. Nevertheless, the statistical correlation between the Shemitah and financial upheaval is a strong one. It may be worthy to note that shortly after the current Shemitah rang in, the stock market suffered a sharp downturn. At the same time, the US experienced a small panic over Ebola. What surprises does the rest of the Shemitah hold in store?